Discover some of Empire Lofts' recent work, projects and installations. Find out how we enhanced clients' loft space and completed each job perfectly. After boarding out this loft, the owners wanted us to stop all the tile mortar and dust from falling onto their belongings. We pinned a breathable roof membrane to the inside of their roof. This is a good solution to reduce dust and debris in the loft when plaster boarding is not an option. This was done in a 3 bedroom, 1930s, semi detached house on Milverton Road, Knowle, B93. If you would like a quote over the phone, via email or in person please fill in our request a quote form and we'll get straight back to you. We can custom build hatches on site to fit your exact requirements. This hatch was built to size and ready for a coat of paint before we fitted the loft ladder. It enables us to be able to fit aluminium ladders in a lot more houses than being restricted to the dimensions of the UPVC hatch. This was in a 1980's 2 bed end terrace on Birmingham, B31. 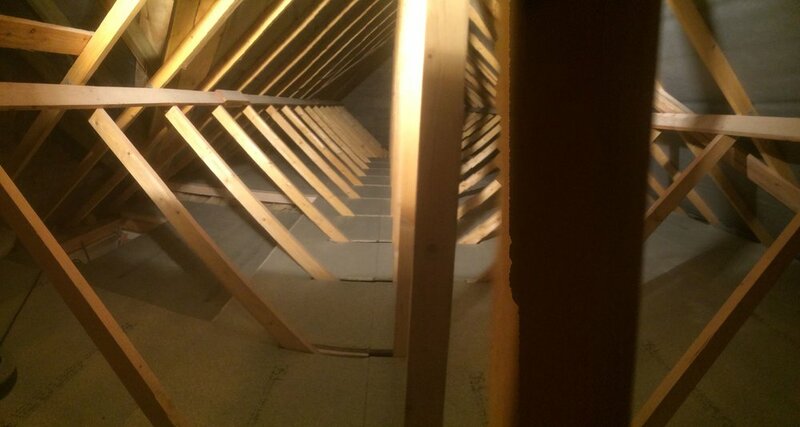 This was a simple job enlarging the current loft hatch to fit a new Fakro timber bi-folding loft ladder. It was installed in a 1980's built 4 bed detached house on Austcliff Drive, Solihull, B91. This couple were after a really safe ladder that was easy to use. "We're not getting any younger". Their words not mine! However there was an obvious choice for them. Fakro build a fantastic wooden bi-folding loft ladder that is strong and effortless to use. The LWL has the standard extra wide foot steps and sturdy construction. But on this particular model they have added a second hand rail and a gas piston release mechanism. This allows the user to lower the ladder down with ease. The piston acts as a brake. In the unlikely event whereby you let go of the ladder in mid air, the ladder will not fall or hit you. Instead, it stops still and starts to retract. This feature is great for cautious users. We installed this ladder so that the couple could access there photography collection easily from their studio. The job was done in a detached 1950's, 4 bed house on Grange Lane, Sutton Coldfield, B75. This house had a very tall ceiling which meant that the loft ladder we installed didn't have much rail left at the top to hold onto when getting into and out of the loft. We custom built them a hand rail / fence around the hatch opening to provide a fixed point to hold. New build houses always have a lot more insulation in the loft as regulations have increased significantly over the years. It is now common to see a minimum of 270mm of insulation in the loft and often we see 400mm. The only way to keep this amount of insulation in place and intact when boarding out a section, is to float a frame over the top. It is very important not to squash down the insulation. You want to allow air to circulate so that moisture can escape. We floated a timber frame 450mm over the ceiling joists and laid an 18mm tongue & groove chip board floor. This floor boarding job was done in a newly built house. This customer wanted his loft boarded but had a lot of insulation and the roof structure made it difficult for him to move around. 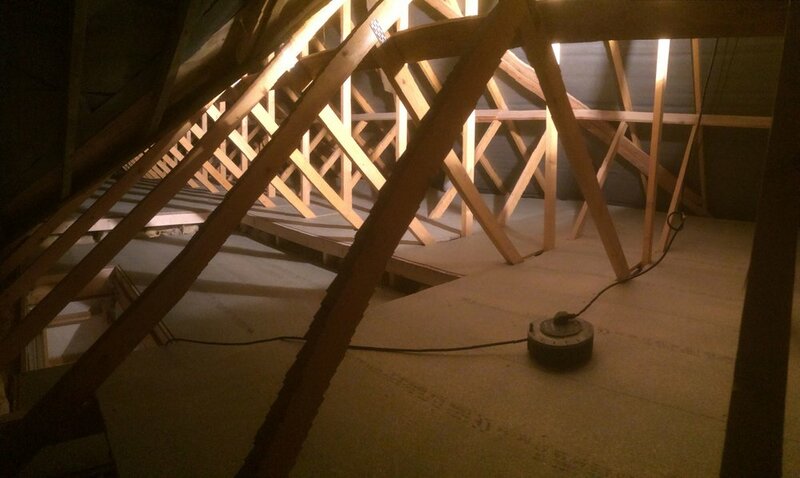 We fitted his loft out with a robust floating frame system, allowing the 270mm of insulation underneath it to breath and have air-flow. This is really important to reduce the risk of condensation building up in the roof. We also installed a 3 stage Youngman Easy-way loft ladder and UPVC hatch for easy access. This job was completed in a newly built, 3 story town house. Standard combination package deal: Aluminium Ladder, UPVC hatch & 12ft/12ft of flooring. This was fitted in a 2 bed, 1970's semi-detached house. This lady wanted her loft boarded out and a new loft ladder fitted. We raised the floor to float it above the insulation, boarded it out with an 18mm tongue & groove flooring system and fitted her a 3 section aluminium Titan loft ladder. Because of the height of the ceiling we also installed a custom built safety fence and hand rail to help the operation of getting into and out of the loft safely. This job was completed in a 4 bed, mid terrace house on Binley Road, Coventry, CV3. This job was very common and is a simple way to achieve a great storage space for all your bits and bobs. We floated a frame in a new built, truss roof house, over the top of the insulation and screwed into place an 18mm tongue & groove floor system. We finished this job off with an extra large custom built hatch and a strong 3 section aluminium loft ladder. This was completed in a new built, 3 bed terrace.. This family wanted a simple easy access loft ladder that the whole family could use safely. A Fakro timber bi-folding ladder does the trick. Light weight, simple and easy to use with strong and comfy treads. We also boarded out the centre section of the loft space with a raised / floating timber frame. It's really important to raise the boarding over the insulation, as it allows your loft to breathe. This job was completed in a newly built, 4 bedroom detached house on Blenheim Way, Moreton-in-Marsh, GL56. These guys wanted more light over their stairs. Even though it was a narrow space, we were able to fit them a Fakro 55cm/98cm top-hung, natural pine, centre pivot roof window. This was fitted in a 1990s style, 2 bed house at The Furrows, Bromsgrove, B60. In a 3 bed, semi detached, 1960's house, we fitted a new 3 section loft ladder and 100 sqft of loft boarding. For this job, the owner wanted a new custom hatch fitted with a drop down door, a light weight aluminium loft ladder and a safety fence / hand rail to help her get into and out of the loft easily. This job was completed in a 3 bed semi detached house on Lichfield Avenue, Evesham, WR11. We fitted a PV-coated, center pivot roof window with measurements 550mm/780mm. It was installed in a bathroom extension with a slate roof and gave the room much needed natural light. This was fitted in a 2 bed terrace house on Fordhouse Lane, Birmingham, B30 3AA. This was a typical relocation job. We relocated the hatch to a bedroom where there was enough room for the ladder. We also fitted 8sqm of loft boarding on a 150mm raised frame. This work was completed in a 4 bed detached house on School Street, Honeybourne, Evesham, WR11 7PL. This house had an inverted truss roof which made it difficult to use as a storage space because of all the diagonal trusses in the loft. We floated a timber frame 300mm above the exsisting ceiling to allow the insulation to sit without being squashed. Cutting out around all the trusses is a long and slow process but once complete, makes this space very usable. This was done in a 5 bedroom detached house in Welford-on-Avon, CV37. At this house, we raised the floor height 170mm, floated a frame, added top up insulation, boarded out an area of the loft and finished it off with a new hatch and 3 stage aluminium ladder. Building a Basic Storage Room in Yardley, Birmingham. For this particular house, we were able to supply and fit all the above for £1855. This storage room was created in a 3 bed, semi-detached house on Berkeley Road East, Yardley, B25. This man wanted his hatch relocated onto his landing as his current hatch was very small and in his bathroom. Empire Lofts were able to complete this work in a couple of hours with no decorating necessary after the job was complete. Relocating the hatch hole is often a great idea. In order to safely and easily get up into the loft with bulky items, you will need a good amount of space to access the ladder. Also, the better ladders need swing room and clearance on the landing and in the loft. This job was done in a 3 bed, semi-detached house on Vibart Road, Sheldon, Birmingham, B26. Empire Lofts specialise in creating amazing spaces in your loft. Whether you simply want better access with a loft ladder and hatch, or you would like to utilise the space with boarding, roof windows and electrics, Empire Lofts can help. If you would like a quote over the phone, via e-mail or in person please fill in our request a quote form and we'll get straight back to you. Why? We use this information to improve our response to your request. Please tick this box if you are aware of the Terms & Conditions of this site, and what we use your data for. We are proud of our workmanship. See how our customers have rated us on Facebook & Google links below. Empire Lofts is a Trading Name under Wave Rock Ltd.